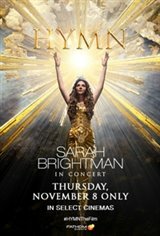 In celebration of her upcoming new album Hymn, best-selling soprano Sarah Brightman is in cinemas November 8 only with an incredible performance. HYMN: Sarah Brightman In Concert was captured live for the big screen from the Festspielhaus in the enchanted Bavarian Alps. Staged in two acts, the 90-minute performance is a hybrid of a musical film, a classical-crossover program and a large-scale concert production. Brightman is accompanied by her band, the Munich orchestra, a 50-voice choir and the Ludwig Ensemble of dancers. Filmed using state-of-the-art video and audio technologies, cinema audiences will also enjoy an exclusive "making of" feature.